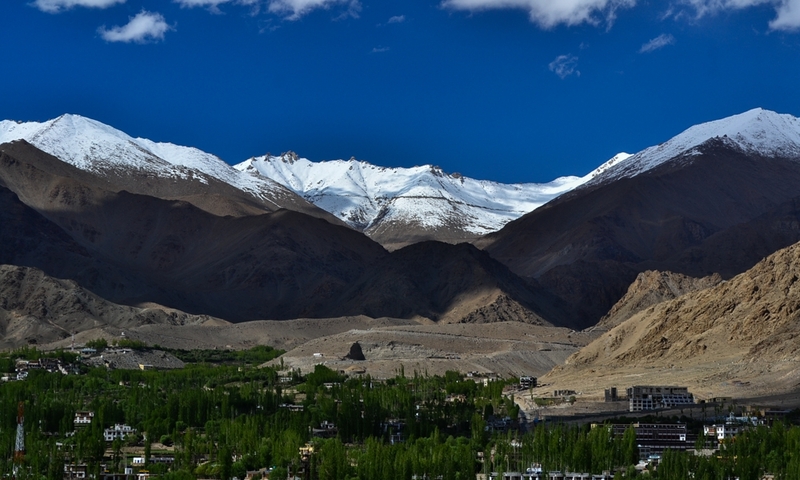 Leh in Ladakh, situated at a height of around 10500 feet, doesn’t quite feel that high initially. Sure, the wind makes it a bit nippy. But the lack of adequate oxygen is not apparent immediately. It is only when one climbs up a storey or two, that the scarce oxygen becomes conspicuous. What is immediately apparent though, is how crowded the town is. We step out of the airport and there is a bunch of white placards with scrawny lettering shoved in our face. Transiting out of the tiny airport parking lot takes us almost half an hour, as it is chock-a-block with SUVs waiting for tourists. And so, we spend a day, waiting for our bodies to adjust and our excitement to settle down, before indulging in touristy things in Leh. After the mandatory day spent for acclimatization, we make our way into town for lunch. 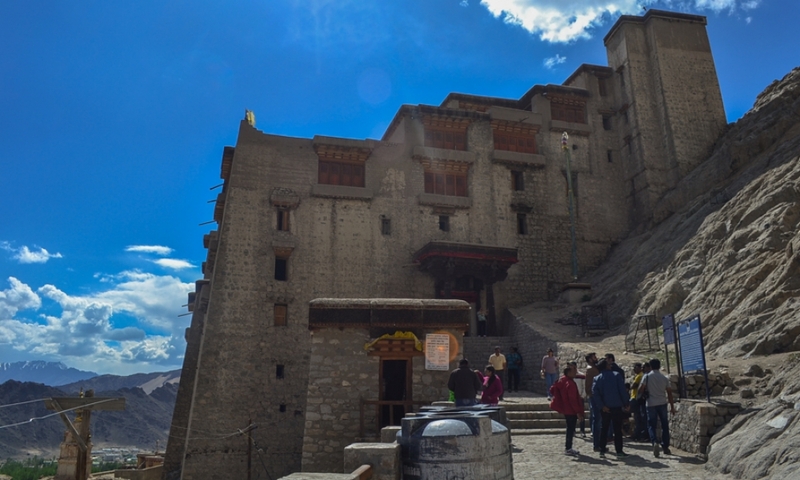 From the center of the town, one’s gaze is drawn to the prominent sight of the long-abandoned Leh palace. The palace, now maintained by the ASI, seems like a good respite from the mid-day sun but inside, it is dark and since it is made of stone, the cold permeates into the walls making it feel more than a few degrees cooler. It is a wonder how the erstwhile residents managed to spend time within these barely insulated rooms during Leh’s unsparing winters. Telltale signs of ancient torches attached to the walls remain on some of the walls, although it is difficult for a layperson to guess the timeline these belong to. 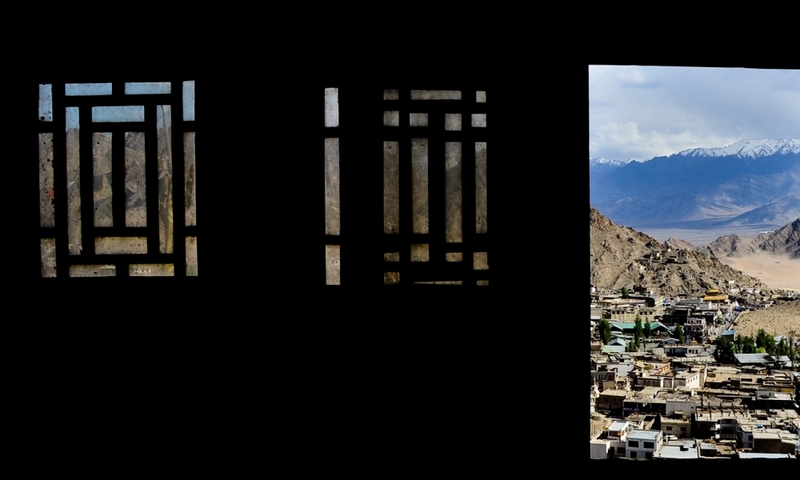 There is a small courtyard on the 3rd storey that looks out into the older part of Leh. 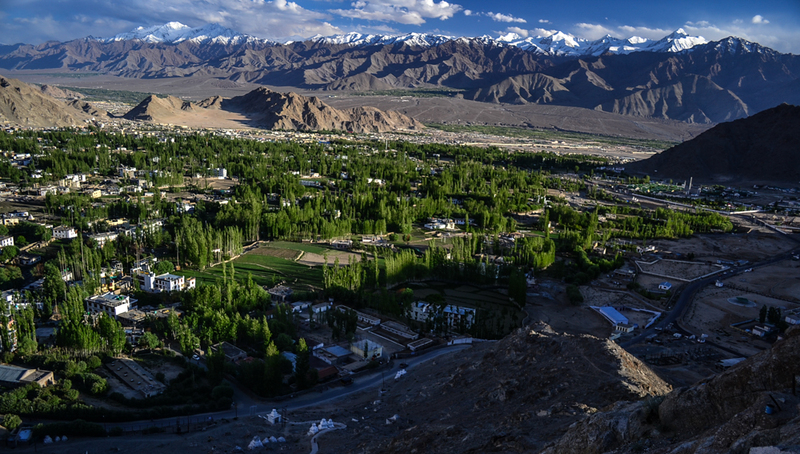 Both the courtyard and the rooftop present stunning 360 degree views of Leh town and the surrounding mountains. 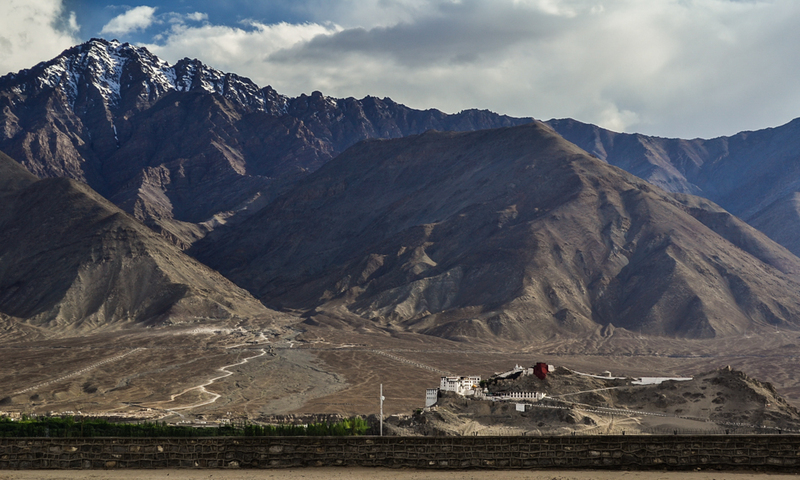 The majestic looking Leh palace almost blends into the mountains with its camouflaged facade. 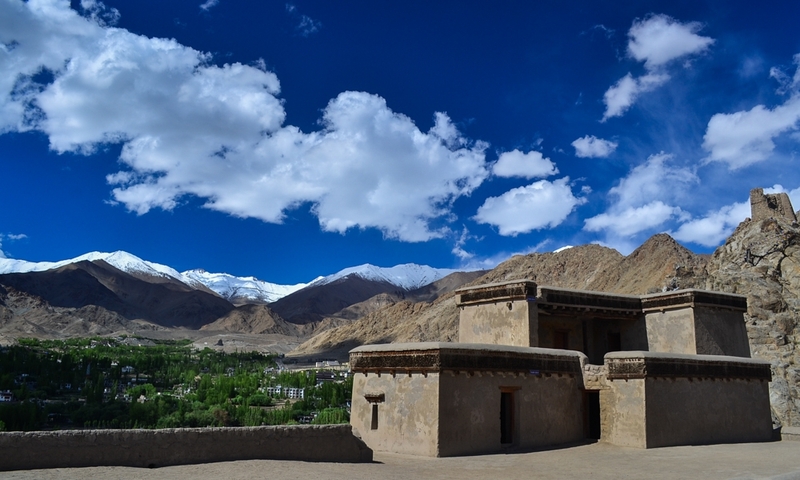 The tales that these walls of Leh palace would tell us, if only they could speak. 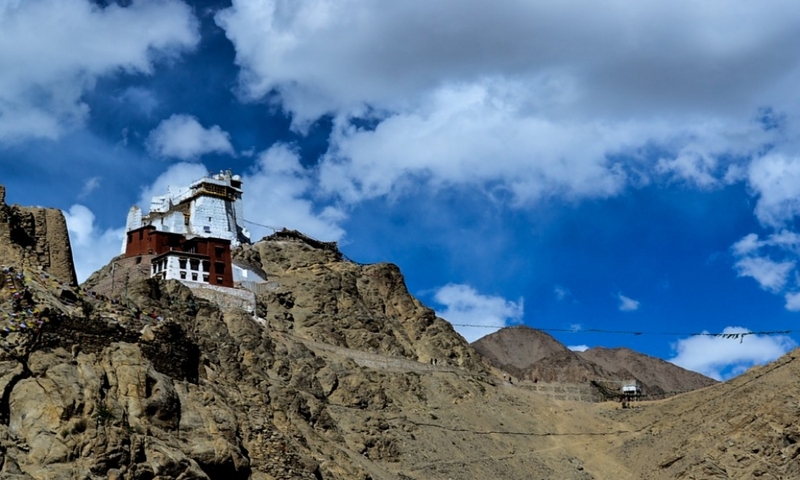 The open roof of Leh palace presents you with a majestic view of the valley, the adjoining Ladakh range and as shown here, the Tsemo Gompa. Most of the rooms in the Leh palace are small, dark and dingy. As you make your way to the top floor, be careful for the low ceilings and the creaking staircases. 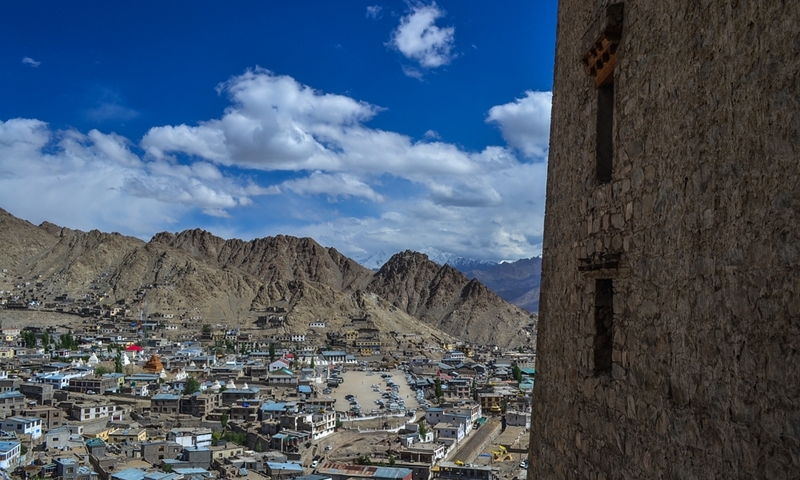 Old Leh, looks upon the new Leh in the distance, from the Leh palace. 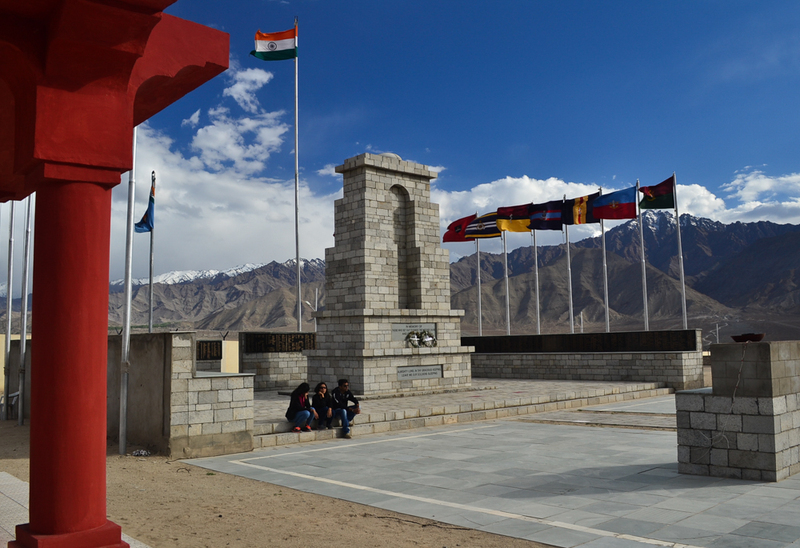 The Leh hall of fame is a war museum, run by the armed forces and situated on the road to Kargil provides a grim study into the bloodied history of the state. Beside maps and photographs of various locations, miniature replicas of air-crafts, dated weapons and odes to the gallant, there is also a war memorial. The sight of the national flag fluttering proud and uninhibited in the wind, invokes an unbelievable sense of patriotism. The hills beyond, in every direction, add an element of disquiet as that is where most of the attacks came from. 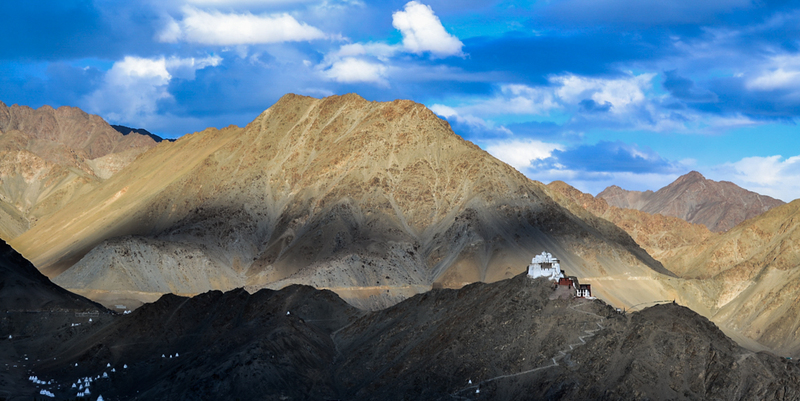 Standing against those hills is the Spituk monastery, a wonderful sight and a day trip for many tourists. The Spituk monastery, visible from the grounds of the hall of fame memorial. What a paradox it is to have an abode of peace watching over a memorial built to the victims of violence. The recruit answers earnestly but a moment later, both of them come in for strict reprimand from an official. Interviewing a solider requires official clearances, unless of course they do not happen to be on duty and are dressed in civilian garb. Outside, the winds begin to get chilly, but a cafe provides some respite in the form of comforting coffee and a warm refuge. The mere thought of exertion makes us wince uncomfortably for a minute, before Tashi, seemingly enjoying our discomfiture, chuckles “Chalo aapko seedhe raste le chalta hu (Fine, let me take you by the usual route instead)” Little do we know his dry humor is going to be a steady companion in the days ahead. The Shanti Stupa is a rather recent addition to this place and it has become the most popular tourist spot in the town. Rightly so, since the view from the Stupa is matched probably only by the Tsemo Gompa. The Shanti Stupa cafe is one that probably offers most value for the rupee. For not only are you higher than most cafes of the world, there is a view on offer that is entirely unmatched in its splendor and totally complementary. The evening sun sets ablaze the golden pagoda of the nearby shrine. 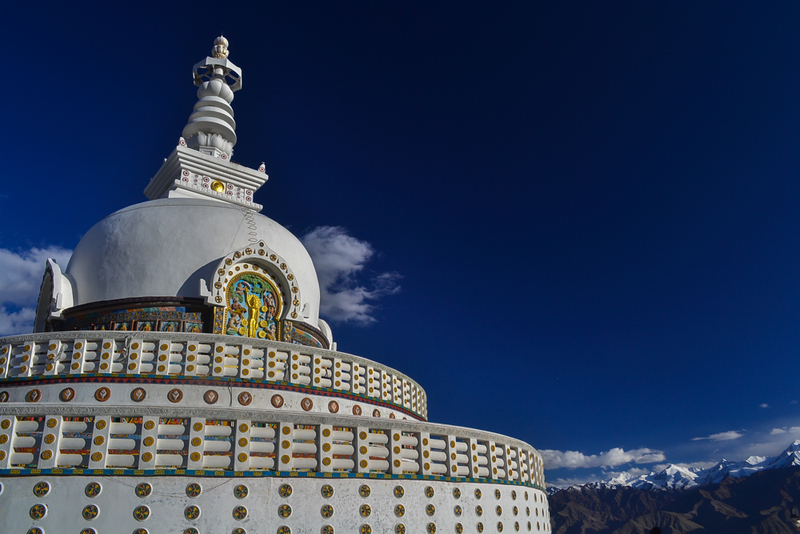 Built between 1983 – 1991 in conjunction with the Japanese Buddhist group, the Stupa stands out like a pearl amidst the deep blue skies and the high mountains. The road that leads to the Stupa was built on the orders of the then prime minister of India, Indira Gandhi. 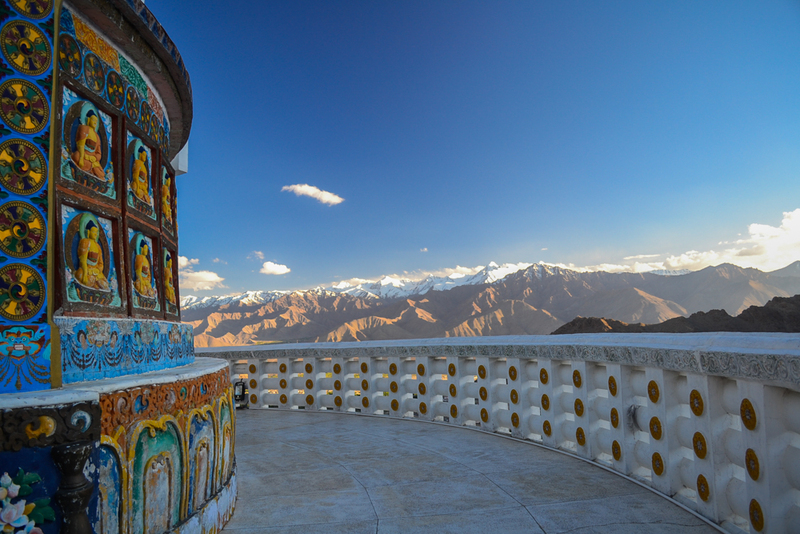 Circumambulating the Stupa gives a panoramic view of the adjoining Zanskar and Ladakh ranges. These murals of the Buddha (as also depictions from his life) can be found etched on to the outside walls of the Stupa. Passing clouds endow much character to the mountains, dramatically casting a shadow on some parts and letting light fall on another. 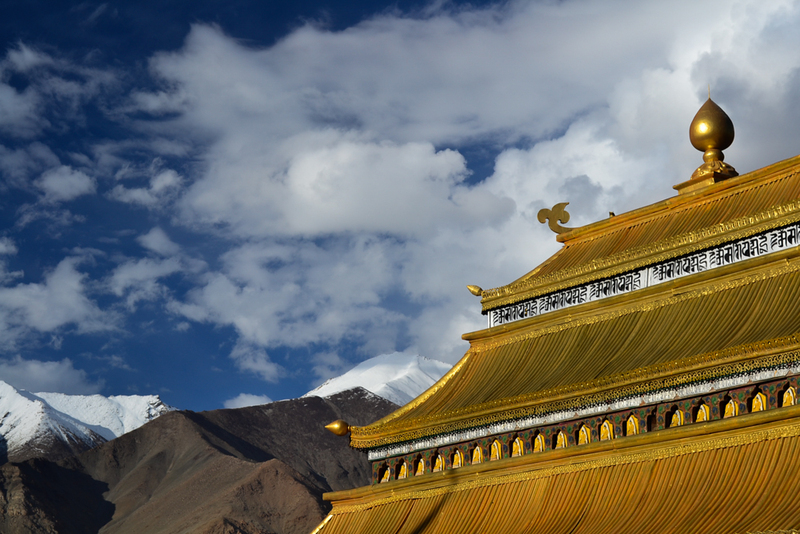 Tsemo manages to gleam white in either case, along with the numerous chortens at its base. The sun sets very late in Leh, this one was taken after 7 pm. It casts a golden glow on everything in the final hour and once it sets, paints the sky with a tinge of purple. That thin line on the snow capped peaks is the Khardungla pass, which was to be next on our Ladakh journey. 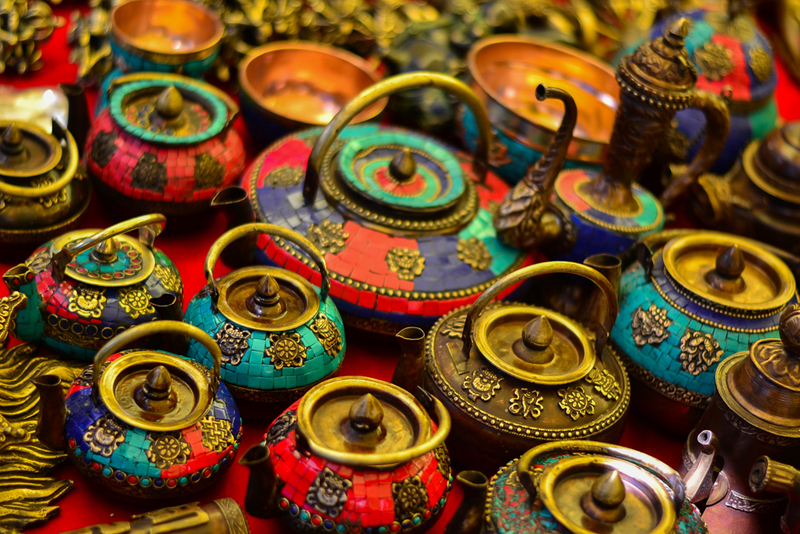 The markets at Leh are a photographer’s delight. But in cold weather, with restaurants and fast food outlets dishing out delicious, piping hot food to cater to every taste bud, we were bound to put on some weight. We work that off by strolling around and looking at the souvenir shops. Thangka paintings, the ubiquitous Tibetan prayer flags, books and journals on Ladakh and the Himalayas, miniature figurines of praying Buddhist monks drums, Tibetan handicrafts and prayer bowls, woolen garments and heap-loads of dry fruits of every kind are some of the wares you can buy off the streets in Leh. 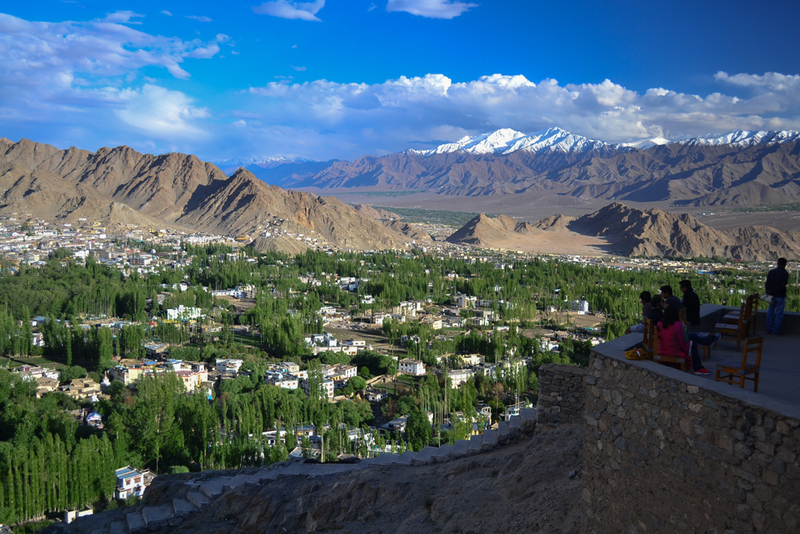 You can pick your stay from a whole host of BnBs, homestays and hotels in Leh. We stayed at the Kidar Hotel on Lower Tukcha road, run by the very amiable Jigmet and his team. 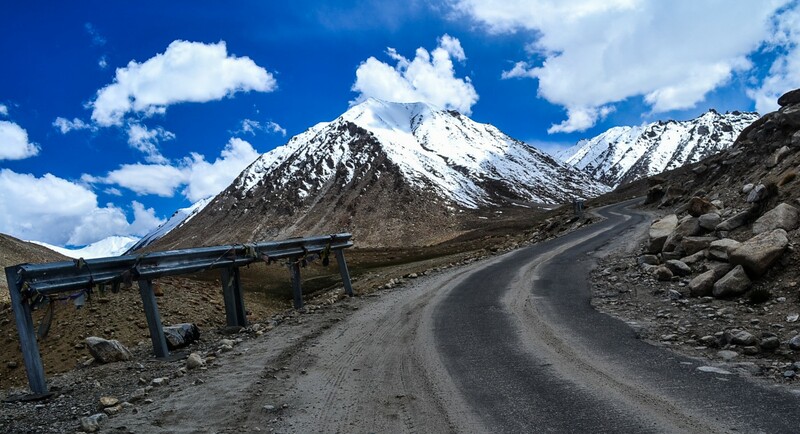 The rooms are clean, airy and the ones on the South Western side have balconies that open up to splendid views of the Zanskar range that you can see in this blog post.